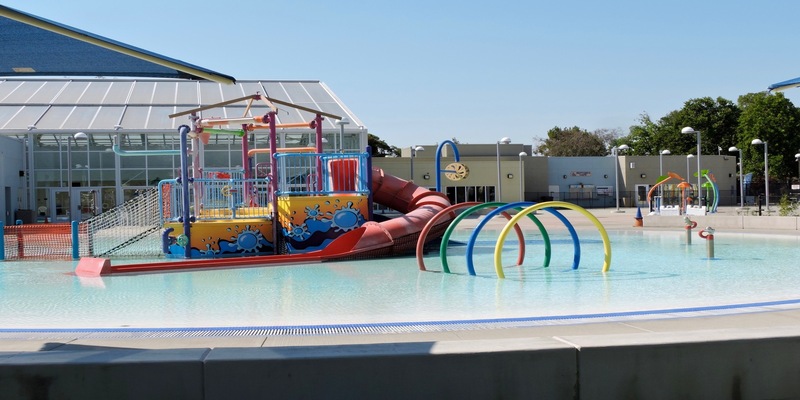 Swim indoors all winter and cool off all summer at the Aquatics Complex at Allan Witt Park. • A natatorium with retractable roof, a zero-depth entry play area, a lazy river current for fun, therapy, and exercise, and a six-lane activity pool with a slide and diving board. • An outside shallow play area for kids including slides, climbing structures, water dumping toys and water spray toys adjacent to a grass area for families to lounge and enjoy the sunshine. • Two 30-foot giant pool slides to keep both kids and adults entertained. • Group picnic areas to use for the day or rent the entire Complex after hours for company parties, school field trips, and special occasions. • Indoor meeting and party rooms for smaller groups to enjoy the Complex and have your group catered to in a private setting.